Caption Our mission is to produce the annual event known as "Burning Man" and to guide nurture and protect the more permanent community created by its culture. Our intention is to generate society that connects each individual to his or her creative powers to participation in community to the larger realm of civic life and to the even greater world of nature that exists beyond society. 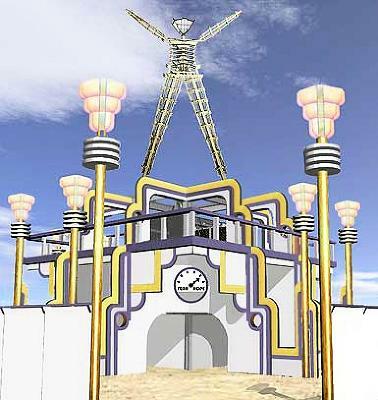 We believe that the experience of Burning Man can produce positive spiritual change in the world. To this end it is equally important that we communicate with one another with the citizens of Black Rock City and with the community of Burning Man wherever it may arise. Burning Man is radically inclusive and its meaning is potentially accessible to anyone. The touchstone of value in our culture will always be immediacy: experience before theory moral relationships before politics survival before services roles before jobs embodied ritual before symbolism work before vested interest participant support before sponsorship. Finally in order to accomplish these ends Burning Man must endure as a self-supporting enterprise that is capable of sustaining the lives of those who dedicate themselves to its work. From this devotion spring those duties that we owe to one another. We will always burn the Man.